Memphis MOJO: I craned my neck and saw . . . I craned my neck and saw . . . 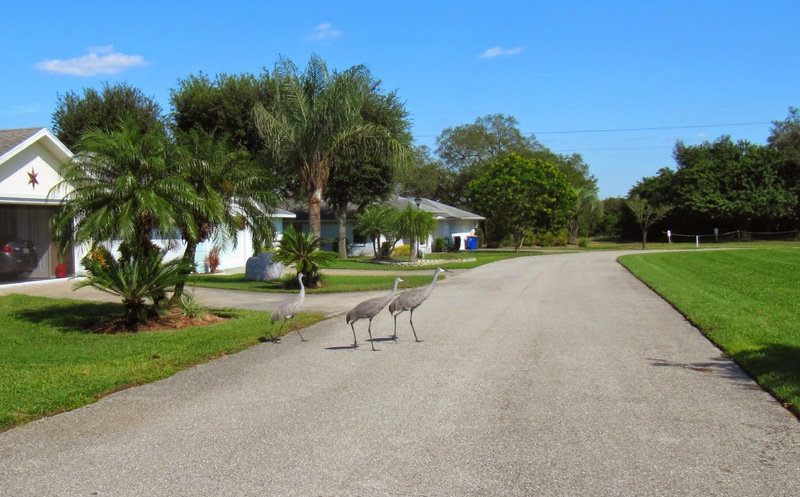 While talking on the phone, I looked out the back window and saw three Sandhill cranes marching through (I'm in Florida now). By the time I retrieved my camera and rushed outside, they were in the front and crossing the street (click photo to enlarge). I've had an egret in my garage, seen osprey nests on power-line towers, and other birds, too. Florida is an amazing place. Looks like you have park area across from house. (Didn't see any driveways.) Nice! My old house was right under the flyway for the Lesser Sandhills. Their sound is unmistakable. Just south was a flocking area and you could see thousands in the air and feeding in farm fields. Aren't they interesting creatures? We had a few in our yard in Stone Creek and they showed no fear - one walked almost all the way up to my camera. I've also seen them on a golf course here and a few down in Eustis one day. Love your neighborhood. Hope you're having a great season so far! Hi Dave! Thanks so much for your comments on L & L Photography! Hope you're having a good time down here even though you don't play golf. ;) What about this weather? After a very rainy and warm summer this feels like heaven. I've got a health problem (cancer) and will have surgery on Thursday at the Moffitt Cancer Center in Tampa. If they get it all (it's in the renal pelvis of the right kidney) I should be in good shape. But I will lose a kidney in the process. So, I won't be posting for awhile - probably a couple of weeks before I'll feel much like doing anything. Take good care of yourself. It seems to get harder as you get older! That's great. 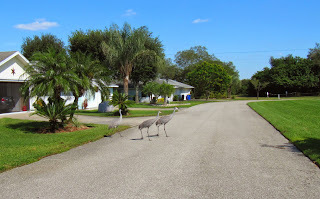 I haven't seen a Sandhill crane in over 30 years :( We just don't get them in New England.